Unfamiliar with Dropbox? It’s basically a free file hosting service, but it’s also much more. 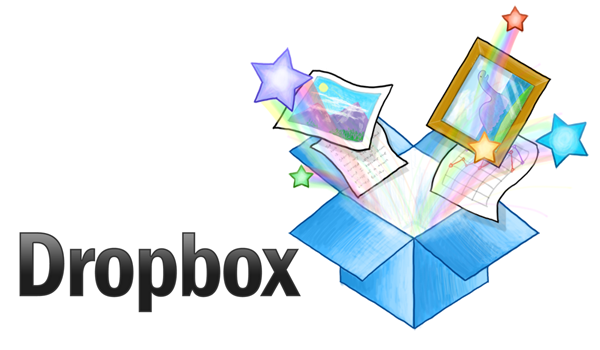 Did you know that you can even host your own websites on Dropbox, for example? Dropbox has numerous benefits: for productivity, peace of mind, and good old convenience. Since standard Dropbox is free, go ahead and sign up. You won’t regret it. Dropbox is powerful, and most users don’t make full use of its services, so let’s look at some Dropbox tricks you didn’t know about. 1. Easily get more space on Dropbox, for free. To know Dropbox is to love it, so let’s look at how you can get more space, completely for free. 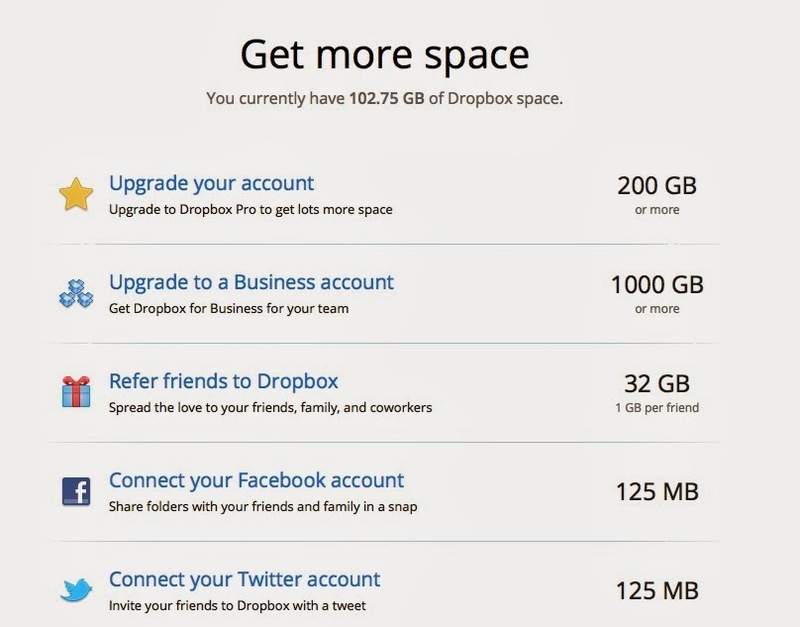 Dropbox has its own “get more space” page, and the easiest way to get more space is (duh!) to pay for it. Free ways to get more space include referring friends (one gigabyte per friend, up to 32 gigabytes), following Dropbox on Twitter, and connecting your Facebook and Twitter accounts to the service. 2. Share BIG files and folders with ease. If you’ve ever tried to send a huge file via email, you know that there are many challenges. End the frustration. Use Dropbox. You can share any file and folder you add to your public Dropbox folder using its link. Right-click on a file in your public folder in Dropbox, and choose Copy Public Link. Send the link to anyone with whom you want to share the file, or post the link online. If you want to collaborate with others, it’s easy. Create a folder, and invite others to share it. When you work on a file in a shared folder, files are updated across every participants’ folder. 3. Use Dropbox as a download delivery system for sales. If you’re starting a business selling downloads like MP3s, images, or ebooks, you can use Dropbox to deliver the files. Let’s say you’re a keen photographer. A family friend sees your portfolio, and wants to buy an image. You sell the image. It occurs to you that others might be interested in your images, so you decide to offer them for sale. You create a small website, and you make sales. Just send your buyers the links to their purchased images in your public Dropbox folder so that they can download them. Obviously this system isn’t ideal for the long term, but it’s a simple, hassle-free way to sell downloads. 4. Use Dropbox to access needed files, wherever you are. Think of Dropbox as your digital suitcase. You can take needed files with you, so that you can access them on any device. Check out Mobile Dropbox now. When you install Mobile Dropbox on your iOS, Android, Blackberry or Kindle Fire, you have access to everything in Dropbox, no matter where you are. You can use Mobile Dropbox to work on business documents at home; just copy the files to Dropbox. If you create files on your home computer, and save them to Dropbox, you can access them at work. Wish you could use Dropbox on third-part computers? You can. Send to Dropbox is a great free third-party service combining email and Dropbox. You receive a unique email address to send your files to Dropbox. Your files are placed in Dropbox/Apps/Attachments. 5. Use Dropbox for security: back up your most important files to Dropbox. No matter how careful you are, and how often you back up your computer, things can go wrong. If you have files which you can’t afford to lose, copy them to Dropbox. Some apps will back up to Dropbox automatically, so check your favorite app to see whether there’s a Back Up to Dropbox option. 6. Use Dropbox as a photo archive. You can use Dropbox to manage your photos. Any images you’ve saved to Dropbox now appear in an image archive, sorted by date. You can create photo albums, so that you can easily share important photos with friends. Want to use your images on the Web? Just drag the image into your public folder and grab the link. 7. Publish a website on Dropbox. Want to create a website in Dropbox? 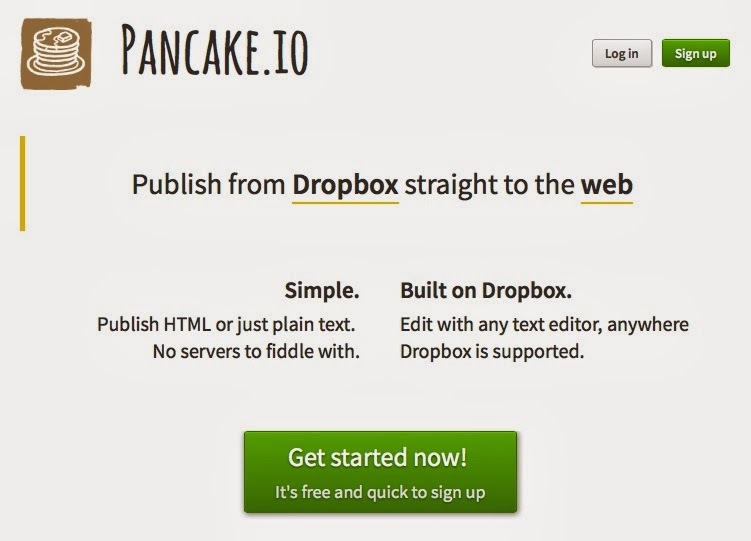 You can, with Pancake.io. Get as fancy as you like, or just publish plain text. You don’t need to worry about domain names and hosting to create a super-quick website. Pancake.io supports popular files types too, such as MS Office documents, PDFs, and images. Want to get fancy with Pancake.io? You can. Check out the Help files here. 8. Digital nomad? Use Dropbox for all your documents. What if you want access to all your files, everywhere? You can do that if you wish. Create a documents folder in Dropbox, and make that your default documents folder across all your computers. Of course, if you have a huge documents folder, you’ll want to get extra storage from Dropbox to make sure that you have sufficient space for all your files. 9. Rock on: sync your iTunes library between your home and work computers. If you want to play your music and videos everywhere, you can sync your iTunes library to Dropbox. Just move your iTunes library to a folder in Dropbox. Then hold down the Shift key on a PC, or the Option key on a Mac, when you start iTunes. iTunes will ask for the new location of your library: browse to your Dropbox folder. 10. Save space on small computers with Selective Sync. If you’re using a computer with a small hard drive, turn on Selective Sync. This option lets you choose which folders you want to be synced to a computer. Access this option via Preferences/Advanced/ Change Settings, and you can choose which folders will be synced to the computer you’re using. 11. Back up apps to Dropbox. Many apps, especially those which work across multiple devices, will back themselves up to Dropbox if you choose Dropbox as your backup location. Check out the backup locations in the preferences and settings of your favorite apps to see whether they offer this option. Two of my own favorite apps, Scrivener and 1Password, back up seamlessly to Dropbox. So there you have it: 11 Dropbox tricks to make your life easier.